The battle over truck driver hours of service isn’t just about hours. It’s also about record-keeping. The American Trucking Associations is suing the Department of Transportation in an attempt to force the DOT to define what supporting documents trucking companies must keep to prove their drivers comply with federal limits on driving time. The lawsuit ratchets up pressure on the DOT as it reworks hours-of-service rules issued by the Bush administration. The ATA wants the U.S. District Court in Washington to order the DOT to rule on what documents are acceptable and how long companies must keep them on file for federal inspectors. Informal guidelines allow carriers to keep a variety of documents to demonstrate compliance, but the association says it wants more clarity and consistency. Typically, carriers keep not only driver logbooks but also fuel and toll receipts and other paper, and increasingly electronic, records to check and verify those driver logs. Congress ordered the DOT to develop a rule on supporting documents in 1994, when it first ordered an extensive revision of decades-old hours-of-service rules. Global demand for industrial commodities is accelerating as the economic recovery gains traction and industries worldwide gear up to resume production. The index of industrial prices tracked by The Journal of Commerce and the Economic Cycle Research Institute rose to its highest level in 15 months in the week ended Jan. 15. 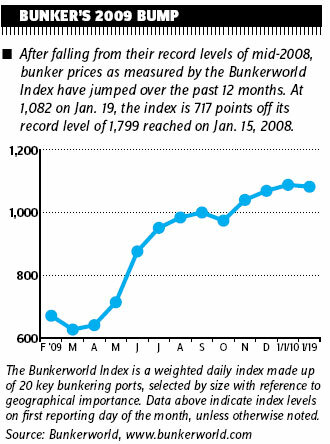 The index, the leading indicator of industrial demand, which looks at pricing for a broad assortment of raw materials used in production, increased by 1.6909 points from the week before, surpassing all 2009 and 2010 readings. It is now more than 45 points above year-earlier levels and at a height not seen since mid-October 2008, a month after the collapse of Lehman Brothers. The index has proved to be an accurate indicator of dry bulk freight rates measured by the Baltic Exchange Index since 1985. In the wake of the steady five-month increase in the JOC-ECRI index since it first moved back into positive territory in late July, China Cosco Holdings, the world’s largest operator of dry bulk vessels, predicted last week the Baltic Dry Index would jump as much as 54 percent this year from 2009’s levels, boosted by Chinese demand. Erroll Southers withdrew his nomination as President Obama’s choice to head the Transportation Security Administration, blaming “political ideology” for keeping the key security post in limbo for months. “It is clear that my nomination has become a lightning rod for those who have chosen to push a political agenda at the risk of the safety and security of the American people,” Southers said in a statement released by the White House. This partisan climate is unacceptable, and I refuse to allow myself to remain part of their dialogue.” The Senate Commerce Committee approved Southers’ nomination last October, but Sen. Jim DeMint, R-S.C., blocked it over concerns Southers would support the unionization of TSA workers. More Republicans joined the opposition after the Washington Post reported on Jan. 1 that Southers had given misleading information to the White House and Senate about improperly accessing a federal database for personal information about his ex-wife. The World Shipping Council is proposing a tiered efficiency system that it says would reduce greenhouse gas emissions by promoting greater efficiency in ships. The WSC said the Vessel Efficiency System would be similar to fuel economy standards the U.S. applies to cars and trucks. Newly built ships would meet mandatory design standards through the application of energy efficiency technologies. The system also would encourage efficiency in existing vessels, but with relaxed standards. The WSC said most ships operating now are limited in the amount they can reduce carbon dioxide emissions. Existing ships that met the emissions standard would operate without fees; ships that did not would pay a per-ton fee on the fuel they consume. Fees would be graduated based on how close a ship got to meeting the standard. The International Maritime Organization would manage the fees. The WSC said the system would reward improved efficiency across the fleet, and discourage the use of the least efficient vessel. The IMO is scheduled to meet in March to again take up greenhouse gas issues. The group failed to adopt a greenhouse gas control protocol before the U.N. climate change conference in Copenhagen last December. CSX Corp., parent company of the nation’s largest eastern railroad, kicked off the fourth-quarter earnings season by reporting $2.3 billion in revenue, a decline of 13 percent from a year earlier, as income from continuing operations slid 16 percent to $305 million. Still, CSX managed a 13.2 percent profit relative to its receipts in the quarter ending Dec. 25, as it shaved expenses by 12 percent. Because CSX Corp.’s earnings no longer show the money-losing Greenbrier Hotel holdings that weighed it down at the end of 2008, net income rose 23 percent from $247 million a year earlier. Its profit relative to receipts for all of 2009 was 12.7 percent. Net income fell 16 percent to $1.2 billion, as revenue fell 20 percent to $9.0 billion, but the company also cut costs by 20 percent. Its volume in the last three months of 2009 declined 7 percent from the comparable 2008 period, when shipments just began to plummet in the aftermath of the financial crisis. But intermodal volume increased 5 percent and automotive hauls rose 3 percent in the latest quarter. CMA CGM officially appointed Philippe Soulie, former head of French construction group Cnim, CEO of the troubled ocean container carrier. In its first meeting last week, the recently elected board of directors of Marseilles-based CMA CGM also named Jacques Saade chairman of the company he established in 1978 and built into the world’s third-largest carrier. Farid Salem, Rodolphe Saade and Jean-Yves Schapiro were appointed executive directors. Jacques Saade in December agreed to loosen family control of CMA CGM to obtain an urgently needed $500 million credit line that is due to be paid this month. After reviewing the latest industry trends, the company said it expects to see further improvement in revenue, supported by high load factors and rising freight rates this year, building on the company’s return to operating profit in the fourth quarter of 2009. The carrier is negotiating with its 63 creditor banks to restructure its $5.6 billion debt and is talking with Asian shipyards about canceling and/or delaying delivery of 30 of the 45 ships it has ordered.